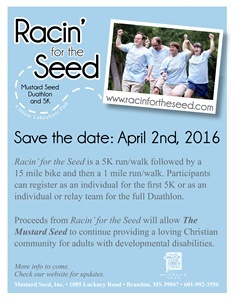 Racin' for the Seed is the annual duathlon at the Rez benefiting The Mustard Seed. It begins as a 5K run/walk followed by a 15 mile bike and 1 mile run/walk. You can register either as an individual or relay team. This year, it will take place April 2, 2016 at Lakeshore Park. There are also opportunities for you to volunteer. All the information you need, including a registration form, can be found at the above link, or you can call Mandy Sisson at 601.992.3556.